The last couple of weeks I haven’t been programming at all, only drawing level design for my prototype game. But as soon as I start expand the world I run head first into the limitations of my prototype. The game mechanics are too simple to make something fun out of. So I started breaking the limits, there are no bad ideas in brainstorming. 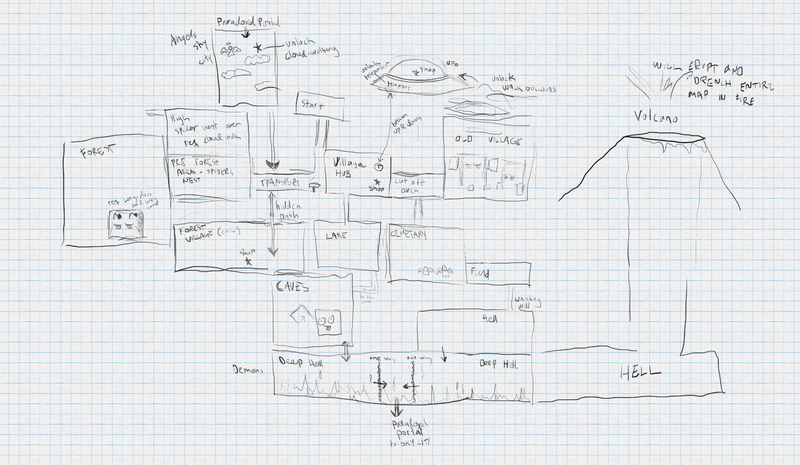 I’ve also found a really neat program that fits my needs perfectly when scribbling with level design! 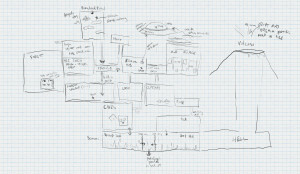 Instead of scribbling with level design on a piece of paper (tends to clutter up a lot), I’ve found Mischief. It’s cheap, it’s super easy to use, and it has a feature called “infinite canvas” and “infinite zoom”. How about if you are being chased by an enormous giant, smashing everything in its way to little pieces, when you suddenly run into an ambush of enemies, flooding in from every side, taking positions on the screen and start shooting at you. And as you struggle to reduce the numbers of the ambush an army helicopter suddenly appears with a mounted minigun, turning the screen into a burning inferno. This scenario (or esp. the doodle of it that I drew) looks awesome, but need seriously improved fighting mechanics. As I realized this the process of level design became much easier. I’m starting to see a picture of the final game more clearly than ever before, and I want to play it! So with this new fighting-intense mechanic in mind I started drawing a simple worldmap. I’m currently working on re-writing the prototype with new fighting mechanics. That is actually a lot harder than you might think, why prototyping is good. It’s far from being ready to display anything yet though, so that’ll have to wait for the next update.